The New Champlain Bridge Corridor (NCBC) project in Montréal, Québec, received the Envision® Platinum award for sustainable infrastructure. Envision recognition for this iconic and regionally important infrastructure project was officially unveiled on June 5, 2018 to coincide with World Environment Day. An award celebration was hosted by Signature on the Saint-Lawrence Construction (SSLC) near the project site in Montréal at the annual BBQ, organized by the Consortium. Attendees at the event included Melissa Peneycad, ISI’s Director of Sustainable Projects, as well as Hugh Boyd, SSL Project Manager; Marthe Robitaille, SSL Environmental Manager; and Chantale Côté, Senior director of the New Champlain bridge project at Infrastructure Canada and a crowd of over 150 people. The NCBC project is the first Envision-recognized project in the province of Québec (fourth in Canada overall) and the second bridge project to earn an Envision award in North America. “The project is subject to very high technical standards of sustainable development and, as a flagship project for Montréal and Canada, it was crucial for SSL to attain the highest possible distinction”, said Hugh Boyd, SSL Project Manager. “Given the unique requirements of this project and the leadership of the SSL Management team in protecting the environment, we wanted to aim for the highest level of recognition, i.e. Platinum. We are very proud today of this result. I thank all the teams that enabled us to attain this prestigious award. This is a great day for us”, said Marthe Robitaille, SSL Environmental Manager. 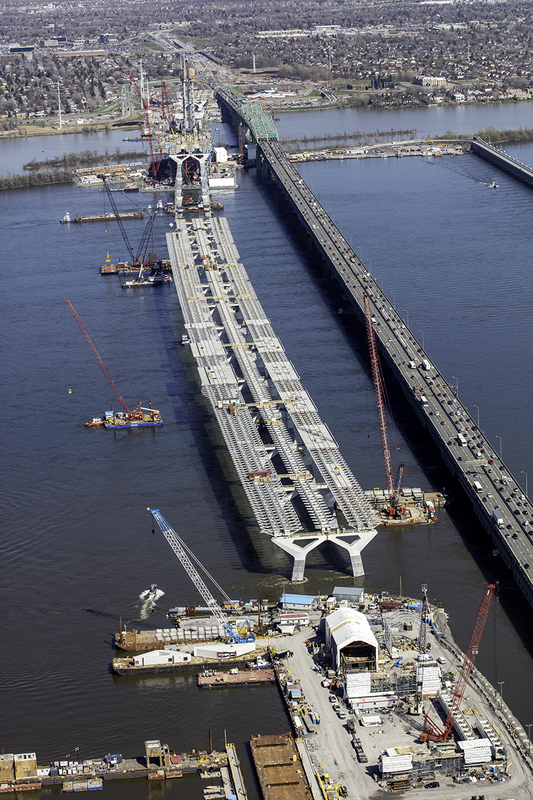 In 2011, the Government of Canada announced the construction of the NCBC to replace the existing Champlain Bridge that was nearing the end of its useful life. 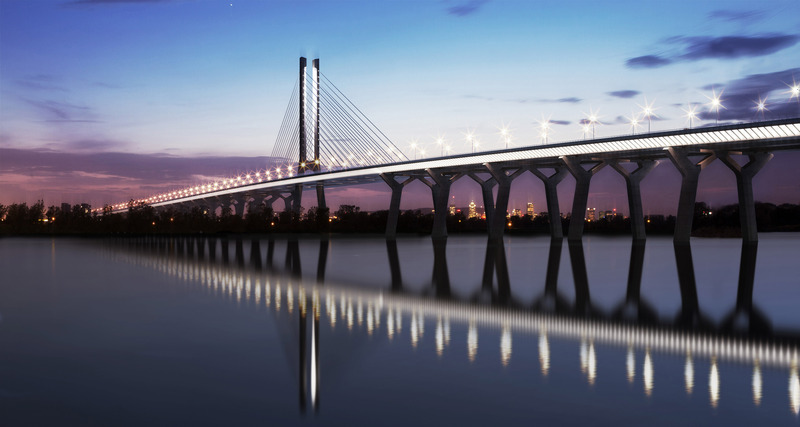 The NCBC project includes a new 3.4-kilometer bridge connecting the cities of Montréal to the west and Brossard to the east, the replacement of the existing Île-des-Soeurs (Nun’s Island) Bridge, as well as highway redevelopment work along the A-15 and A-10 in Montréal and Brossard respectively. The NCBC project is a major regional transportation system and a significant throughway allowing for nearly $20 billion annually in Canada-US trade. It is being delivered through a Public-Private Partnership (PPP) with the Federal Government acting as the public partner and the Signature on the Saint-Lawrence (SSL) as the private partner responsible for carrying out the project. The SSL consortium is comprised of four companies, including SNC-Lavalin, Dragados Canada Inc., Flatiron Construction Canada Limited, and EBC. “I am very pleased that the New Champlain Bridge Corridor Project has earned the Envision® Platinum award. This confirms it is following high standards of sustainable development to ensure the environment is protected. I want to congratulate the environment teams of Infrastructure Canada and Signature on the Saint Lawrence for their hard work in developing and applying the project’s environmental requirements. It is thanks to their efforts that the new Champlain Bridge will not only be a modern effective piece of transportation infrastructure, but also an example of sustainable development and innovation Montréalers and Canadians can be proud of,” said The Honourable Amarjeet Sohi, Minister of Infrastructure and Communities. To reach Envision Platinum status, a project must demonstrate that it delivers a range of environmental, social, and economic benefits to the host and affected communities. The Envision system examines the impact of sustainable infrastructure projects as a whole, through five distinct categories: Quality of Life, Leadership, Resource Allocation, Natural World, and Climate and Risk. These key areas contribute to the positive social, economic, and environmental impacts on a community. Sustainable Growth and Development: As one of the busiest crossings in Canada, the economic contribution of the NCBC project to the provincial economy cannot be overstated. This transportation corridor will support annual traffic of between 40 and 50 million commuters, as well as over $20 billion in international trade. Improvements to mobility brought by the NCBC compared to the existing Champlain Bridge will have a direct positive impact on the economy by reducing travel time for cars and trucks and providing reliable public transit options as well. Community Quality of Life: In addition to addressing safety and security concerns and maintaining the vital economic link of the Champlain Bridge, the NCBC project improves the quality of life of the host and neighbouring communities in a multitude of ways. For example, the project improves accessibility to non-motorized transportation and public transit by including a multi-use path for both pedestrians and cyclists and rehabilitating existing cycling networks on the project site in Montréal, and by including provisions for future light rail transit (LRT) in the center lanes of the bridge. The project also improves community mobility by enabling safer, more secure travel across the corridor, and improving the efficiency of traffic flows, especially on the approaches to the NCBC and for communities bordering the project site; and improving pedestrian linkages at the center of Île-des-Soeurs, under the highway, to allow connection between the northern and southern portions of the area. Leadership in Sustainability: As the owner of the project, the Government of Canada laid a strong foundation for sustainability. The Federal Sustainable Development Act (FSDA) publicly articulates the government’s commitments to improving the sustainable performance of Canadian initiatives, projects, and developments. The NCBC project aligns with the FSDA commitments to ensuring continued safety and service, promoting economic growth and providing value for Canadians, and fostering sustainable development and urban integration. Specific to this project and in keeping with each member’s long-standing commitments to sustainability, SSL developed its own policies and tools to ensure the priorities and commitments made by the Government of Canada were translated into concrete actions and outcomes over the life of the project. For example, the project team implemented an extended environmental quality management system (EQMS) to include social aspects in order to improve the project’s sustainable performance across a broad range of social, environmental, economic, and quality indicators. The EQMS was developed in accordance with the International Standard Organization’s 14001 and 9001 standards for environmental and quality management respectively. Active stakeholder engagement and continued dialogue have been among the core principles of the project since its inception. Initial consultations were led by the federal government, and subsequently by SSL. A wide variety of stakeholders were solicited for input throughout project planning and delivery, including residents from the City of Montreal’s Verdun and Sud-Ouest boroughs, residents in the cities of Brossard and Longueuil, members of Mohawk Council of Kahnawake, Port of Montreal, the association of intermunicipal transit councils, and the interregional committee for freight transport. The project addressed several concerns raised by stakeholders, including technical constraints regarding constructing the project over the St. Lawrence Seaway, integrating multi-use paths in the project area, managing traffic flows during and post-construction, reducing noise and vibration for residents in the area, and providing accessibility to public transit. Innovation and Exceptional Performance: The NCBC project exceeded the highest levels of achievement within the Envision system for several credits in the Quality of Life category, earning the project bonus points for exceptional performance. Furthermore, the project is implementing a new passive de-icing concept to mitigate the risk of ice accumulation on the bridge cable-stay system from falling to the bridge below. A modified bridge structure designed to prevent ice from shedding in large quantities was developed in partnership with DSI, the project’s cable-stay system supplier, and the National Research Council of Canada. The construction of the NCBC project is complex; no temporary structure or construction barges are allowed on the St. Lawrence Seaway as this is a dedicated navigation channel where no activity may interfere with maritime traffic. 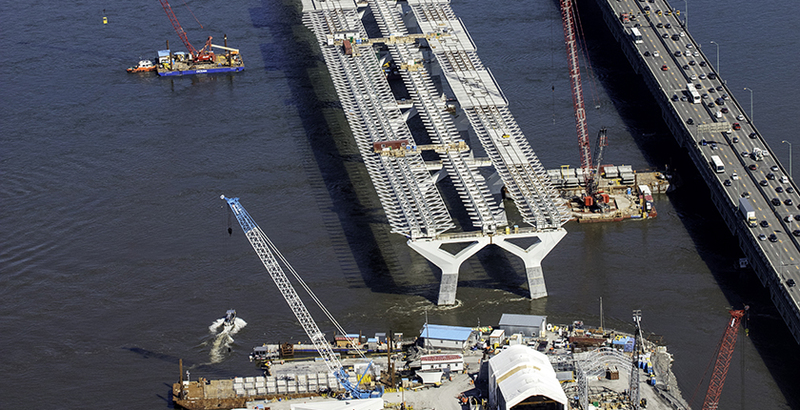 To overcome this technical constraint, the team requested the use of an innovative approach to construction where the assembly of the main span tower of over 240 metres in length could be done without disrupting traffic on the seaway. The approach used by the NCBC project team was the object of an experimental development in the field of civil engineering.